Sprint has dramatically underspent competitors over the past few years, arguing that its superior spectrum position, coupled with its densification efforts, allowed it to serve wireless customers at a fifth of the cost of VZ, ATT, and TMUS. In our previous note “Sprint Behind the Small Cell 8-Ball (10.26.16)”, we surveyed the top 25 cities and found that Sprint was talking a lot about, but not actually deploying, mini-macros at scale. Subsequently, in “Sprint Shows Signs of Life on Small Cells (04.10.17)”, we noted that increased hiring activity by Sprint’s small cells partner Mobilitie indicated near- to intermediate-term construction activity and that we would watch construction efforts to gauge follow-through. On May 2, 2017, Event-Driven, a wireless industry news site, published a report claiming that Sprint approved the construction of non-permitted sites. The report includes what appears to be an internal memo from Sprint’s Vice President of Network Development to area development managers regarding a trial enabling Mobilitie to “commence construction on new wireless sites without full regulatory compliance…” See the Memo here. While the memo appears authentic, we have not received independent confirmation. Assuming the memo and its content are real, this memo jeopardizes the timing of Sprint’s mini-macro build-out and densification efforts. If Mobilitie is not following zoning and permitting regulations or is not submitting to the FCC for NEPA, SHPO, and Tribal Consultation as may be required for some new structures, this could increase the timeline for construction of new mini-macros by six or more months. In the memo, Sprint appears to recognize this. Sprint cites that it was building 33 new mini-macros per week, but that during the trial, new builds dropped to six per week. The memo clarifies that, in the future, Sprint will require that Mobilitie follows all regulatory requirements, and concludes that the “reputational risk” to Sprint outweighs the benefits of proceeding with the trial. We see an increased risk to Sprint’s ability to deploy critical wireless infrastructure, and we reiterate the historically low levels of Capex Sprint has spent over the past few years as a risk to its long-term competitive position. Municipalities in which non-permitted construction occurred will scrutinize Sprint’s (and maybe the industry’s) entire infrastructure portfolio, potentially resulting in take-down orders, fines, and possibly litigation. Sprint may find that the “site count” for this permit-less trial is neutral, or even negative after reviews are conducted by local, state, and federal authorities. Failure by Sprint and/or Mobilitie to get enough sites “on-air” could cascade in unexpected ways. For instance, Sprint may be forced to revise its network densification strategy to a more tower-centric or traditional-small-cell-centric strategy, benefiting the public TowerCos. Sprint may also be forced to rely upon leased fiber or dark fiber, which could change Opex or Capex respectively. There are M&A implications as well. Now that the FCC quiet period has come to a close, there is a slight increase in reputational risk that could potentially drive an acquirer, or a target, toward a rival. However, Sprint’s underspend on the Capex side makes their cash flow look more inviting potentially encouraging suitors. Zooming out, this memo, authentic or not, could hamstring industrywide efforts to reduce regulations related to small cell siting. Perceptions that Mobilitie and Sprint (allegedly) deliberately circumvented municipal regulations imperils petitions to the FCC for relief from such regulations, and the industry’s desired characterization as a “utility” could take longer to achieve, slowing broader CapEx deployments. This note was originally published on 5/2/17 to our research clients. If you are interested in getting more timely access to our research or would like to have a discussion on this note, please contact us. City Says That If Mobilitie can Build a Tower in 2 Days, They Can Also Remove it in 2 Days. You can't make this stuff up. Mobilitie allegedly erected a new mini-macro tower in Goliad, TX – which we posted about on LinkedIn previously. Subsequent to that, this story regarding Sprint approving a trial for Mobilitie to build mini-macro small cell towers without full regulatory compliance is found by reporters at Event-Driven. Harvey also claimed the tower is leaning to the north. Blueprints for the installation require a foundation 31 feet deep into the ground; Harvey who says he has had years of experience mounting poles, says a driller will hit bedrock at the 10-foot level. County officials claim that this type of overnight tower erection was happening in other areas. See the quote below from the Advance-Guard. This isn't the only place where Mobilitie has been either fined or forced to remove what is alleged to be an improperly permitted tower- it has occurred in Baltimore, MD, and Denison, TX. In Penitas, Texas, what appears to be a new small cell pole was erected overnight near a busy thoroughfare. There is a great news story about this in the video below. If you watch the video closely, you will see a small microwave dish at the top which suggests that this is a mini-macro for Sprint, possibly built by Mobilitie. Six or so months ago, we had heard a rumor that Sprint had ordered a few thousand steel poles but because we couldn't get any other confirmation of this, we didn't go public with that information. This specific pole looks like it was clearly pre-manufactured and cookie-cutter. We haven't seen drawings or plan submittals that look like this though anywhere. In reviewing the video, it appears that the company installing it has not added panels to the top of the pole but that there are mounts for them. There is an odd shroud that we surmise may hide additional mounts for other small panels possibly for collocation by other wireless providers. "Went out to the field to kick off our Mobilitie build program. I had an awesome time out in the field again. I miss it from time to time but My office has been very nice to me. Any one in the SE or NE want to be apart of the build program shoot me a message or give me a call. I was able to train a crew and at the same time build 9 sites in 4 days. The money is good even with the rush of the program." If this pole is Mobilitie's, we expect that this type of news story will occur over and over again in recent months as we wonder whether Mobilitie is attempting to get these poles up and standing prior to the FCC proposed rule-making that will be discussed at the April 20th FCC meeting but not enacted for months. 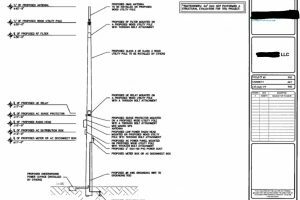 Our read of the tea leaves is that the FCC will not be granting favorable treatment to 50' and taller poles and will likely require that they meet local zoning requirements. If this is the case, Mobilitie may be trying to get poles standing in order to avoid potential zoning requirements that may be required in the future for such poles. We have to wonder whether the entity that constructed this pole submitted and received approval from SHPO/NEPA. The news story says that there was no permit pulled for this pole installation. Further potential evidence of this is that Mobilitie posted 170+ jobs across the country just over a week ago- which included construction and network related jobs. If our suspicions are correct, there will be many news stories like this in the coming months. New not-so-small cell poles will be erected "overnight" and municipalities will be left trying to figure out who built them. Busted! Mobilitie Tries to Install 120′ Poles without Proper Permits AGAIN! We have to start off by clarifying that this isn't an April's Fools joke- despite the timing and it feeling like one. 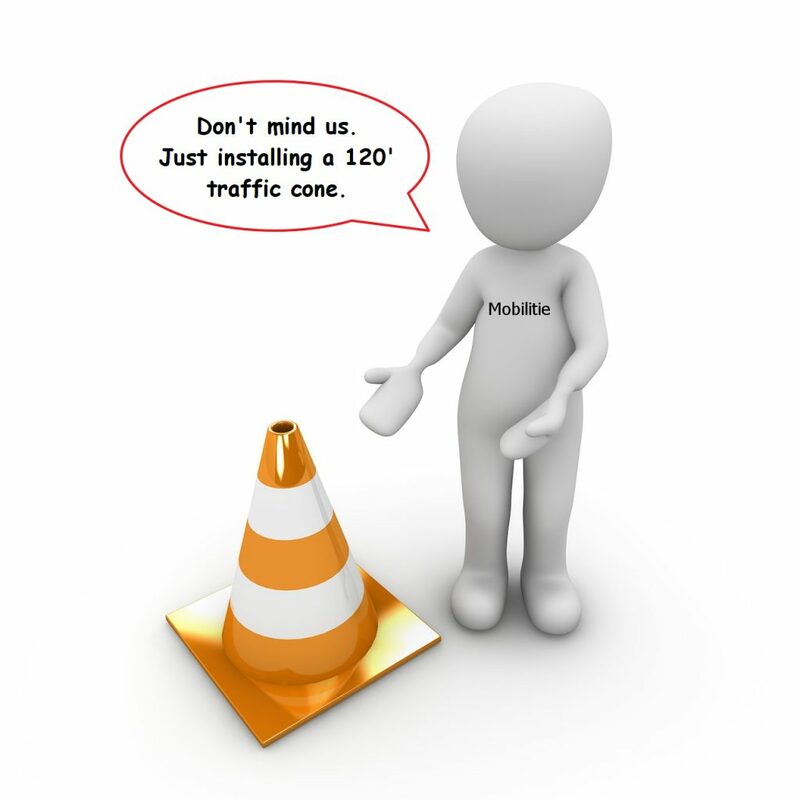 On the eve of possible FCC review of their petition to the FCC for relief from small cell siting restrictions at the local level, Mobilitie is busted yet again trying to install 120' poles without following the proper local permitting and planning procedure. You can see the Post-Star story here. In the first situation, it appears Mobilitie told the fairground official for the fairground where the tower(s) were to be located that they were trying to drill "test holes" and that it was for "the utility company". Did their contractors just not know any better? Was Mobilitie just trying to get the structure standing before anyone would notice? Given this isn't the first time they appear to have tried to erect a pole without a permit, one has to wonder. Last year in April, we wrote about how Crown Castle and Mobilitie respectively approached the City of Orlando regarding small cells. In that post, we described how each company approached the application process and why the City approved the Crown Castle small cells while it determined that the Mobilitie applications were incomplete. We recently came across some data from Montgomery County, MD. If you have followed wireless siting news, there have been a number of stories about Montgomery County and the opposition for small cells from NIMFYs. Interestingly, the data shows a similar story happening in Montgomery County as that which happened in the City of Orlando. Of the 171 small cell or DAS installations submitted by Crown Castle, 81 have been approved or recommended for approval. 90 are under review currently. Of these 171 poles proposed by Crown, only 20 are new poles as opposed to installations on existing utility structures. The average height of all Crown poles/antennas is 28 feet. Another interesting statistic regarding the Crown DAS poles is that 26 of them have two carriers coming out of the ground. Almost all include Verizon- but some include T-Mobile. Mobilitie has taken a different tact and not surprisingly, NONE of the 141 small cells that Mobilitie has applied for have been recommended for approval as of the date of the file we reviewed which appears to be October of last year. The average height of the Mobilitie poles- 66 feet. 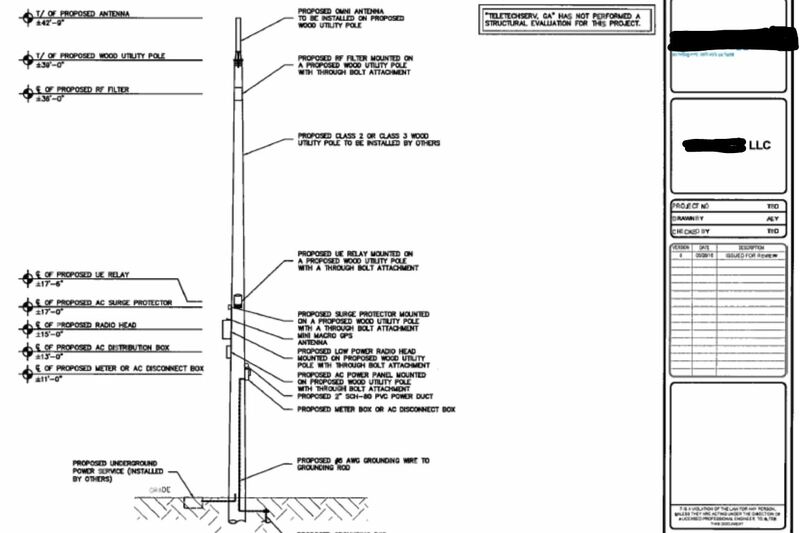 The number of new poles vs attachments to existing poles is 117 to 24 respectively. Lastly, Verizon has submitted 15 small cell applications of their own.